Wow, it’s been a doozey of a month! My full-time day job is Director of Communications for a large church. This is my busiest time, preparing promotions for fall events/classes, building the Stewardship campaign materials, and planning our fall ministry kickoff. Add to that first day of school (yesterday!) for my little one and the fact that my husband is in the middle of tech for his next musical, I am exhausted and maybe a wee bit stressed. Part of that stress is admittedly planning and preparing to attend the American Christian Fiction Writer’s Conference next month in Dallas. I’ll be there for Saturday only because of work, but am so grateful I live so nearby so it’s possible to participate. I’ll be pitching Good Graces to one or two agents (eek!) so there’s a lot of work to be done. One thing I’m not stressed about, but rather super excited about is meeting fellow authors. 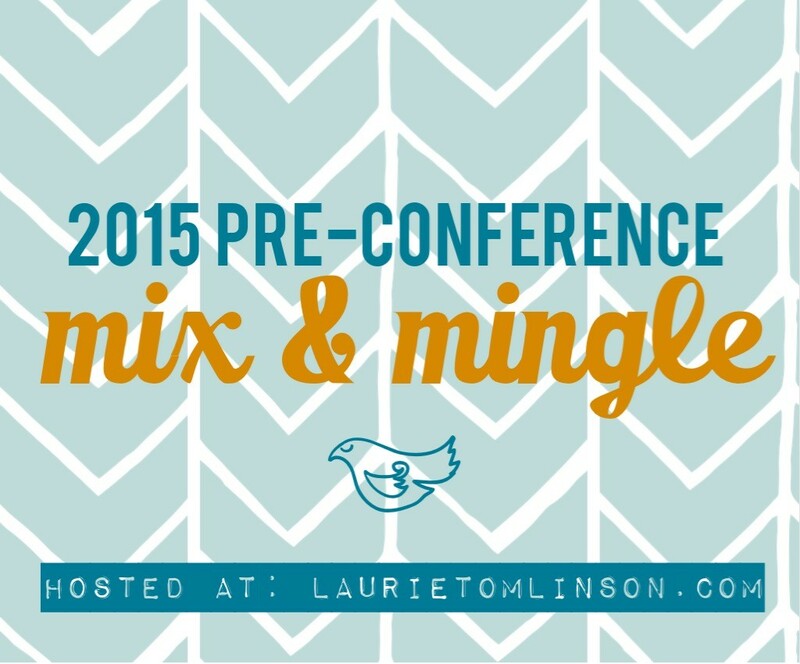 Author Laurie Tomlinson is gracious enough to host a 2015 Pre-Conference Mix & Mingle! Attendees are posting answers to a list of get-to-know-you questions and linking up. What a creative way to build community! Thanks, Laurie. Here are my answers. If you plan to attend ACFW conference, I hope you’ll link up, too! Place in the book world: Pre-published author seeking representation. Completed first full manuscript, Good Graces, and working on second. On a scale of hugger to 10-foot-pole, please rate your personal space: Hugs are my love language. Loved ones at home you’ll be missing: My husband, six-year old daughter, and miniature Schnauzer fur baby Luna Mae. Conference goals we can pray for? My ideal goal would be to find the perfect match with an agent who will love my manuscript as much as I do and want to help me get its message of redeeming grace out to readers. I am also praying that God will use this conference and the people at it to solidify within me the confidence that being an author is one of my callings in life, to renew within me the energy to sustain this author-life amidst other commitments, jobs, and obligations. Anything we can celebrate with you? The blessing of my ACFW critique group, who have been amazingly helpful, thoughtfully attentive, and encouraging during the last several months of work on Good Graces. One or two ways we can help build your platform? Yes! I’d love for you to follow me on Facebook and join our conversations about reading, writing, and faith. Also, consider signing up for my newsletter. I’ll be sending out my first one very soon. It will include book reviews, updates on my projects, and giveaways. Check out other links/ways to connect here. So happy to connect with you! You’re at such a fun stage of the process, so enjoy every minute. I’ll be praying for your connections with agents. Though I *liked* your social media, definitely keep me updated 🙂 Thanks for participating! Thanks, so much! Will do. Great to meet you here, Teresa! I can’t wait to see you at ACFW!! So good to meet you, Teresa. I’m glad you can make it Saturday, and I hope to meet you! Sorry I missed your comment and that it took me so long to approve it! Hoping to meet you too! !